After making big waves in China, one of the most impressive mid-range devices in recent memory is finally up for grabs stateside. Unfortunately, what you’re able to buy right now from Amazon is not technically a Samsung Galaxy A8s (SM-G8870) unlocked version designed specifically for the US market. That obviously means CDMA support for carriers like Verizon and Sprint is out of the question. It is compatible with GSM carriers such as AT&T and T-Mobile, while the LTE may not be available in all areas: UMTS2100 (B1), UMTS1900 (B2), UMTS850 (B5), UMTS900 (B8), CDMA800 (BC0), TD-SCDMA2000, TD-SCDMA1900, LTE2100 (B1), LTE1800 (B3), LTE1700/2100 (B4), LTE850 (B5), LTE2600 (B7), LTE900 (B8), LTE700 (B12), LTE700 (B17), TD-LTE2600 (B38), TD-LTE1900 (B39), TD-LTE2300 (B40), TD-LTE2500 (B41). Samsung Galaxy A8s price in USA has been set at $444.99 for the unlocked model with 6GB RAM + 128GB storage. The handset comes in Gradation Black, Black Green, Blue, and Pink Blue color options. The Samsung Galaxy A8s features a 6.4-inch 2.5D curved glass Full HD+ (2340 × 1080 pixels) resolution screen with an in-display camera, which it calls Infinity-O display that has a small cut out. It is powered by a 2.2 GHz octa-core processor which supported by Snapdragon 710 10nm Mobile Platform with Adreno 616 GPU and 6GB / 8GB of RAM. It packs a 128GB of inbuilt storage which can be expanded via microSD card up to 512GB. On the camera front, the Galaxy A8s comes with triple rear cameras that include a main 24-megapixel sensor with f/1.7 aperture, 10-megapixel Telephoto lens with an f/2.4 aperture for 2x optical zoom, and a 5-megapixel camera to capture depth information for portrait shots and LED flash. For selfie, there is a 24-megapixel front-facing camera with f/2.0 aperture. 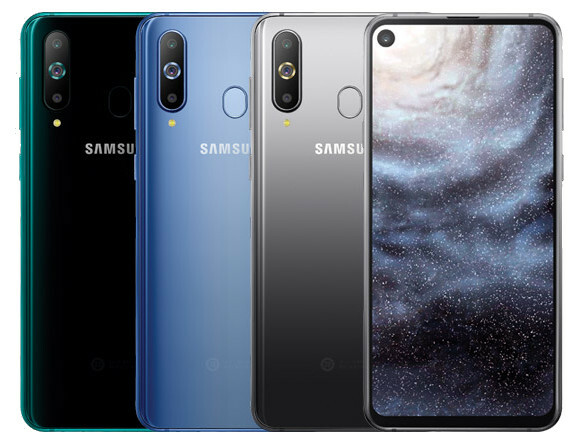 The Samsung Galaxy A8s has a rear-mounted fingerprint scanner, and also comes with a glass back panel. The handset runs on Android 8.1 Oreo out of the box and packs a 3400mAh battery with fast charging support. It supports dual SIM slot with 4G VoLTE, 3G, Wi-Fi 802.11 b/g/n/ac, VHT80, GPS, GLONASS, Bluetooth 5, NFC, and USB C. The device measures 158.4×74.9×7.4mm and weighs 173 grams.